"Seek Those Who Fan Your Flames"
Throughout the first half of “Seek Those Who Fan Your Flames,” we get several exhilarating sequences involving Shaolin Fantastic’s tutelage in DJing. It begins with Grandmaster Flash giving him and the other members of Fantastic Four Plus One a crayon, which holds “the key to his quick-mix theory.” After many joints and a lot of waiting around, Ezekiel finally realizes the crayon’s purpose: to mark that special spot in a record’s groove—the moment that, when brought back to the break and repeated, makes the crowd go wild. Every subsequent scene builds upon this revelation as Shao hones his turntable skills, applying mathematics, calmness, and even a bit of symbolic time-traveling to his craft until he’s finally on his way to becoming a bona fide mixmaster. None of this is filmed with complete realism. Director Ed Bianchi shoots the DJ scenes the same way one would shoot training montages in a kung fu movie, complete with whooshing sound effects for Flash and Shaolin’s hand movements and vaguely Eastern music. At one point, the mentor even vanishes from the room a la Batman or Spider-Man without Shao or Ezekiel noticing. But the slight magical-realist moments never feel out of place, as we’re seeing Flash and his teachings through the eyes of two teenagers who view him as a hero. To Shao and Zeke, Flash is a figure of mythic proportions. He’s someone to be idolized. Did he actually vanish into thin air? No. Is he actually time-traveling when he jumps between both the past and the future with his beats? Of course not. But he may as well be. As kids, we’re much more likely to believe the legend of someone we look up to; to convince ourselves that they’re practicing honest-to-God magic before our very eyes. 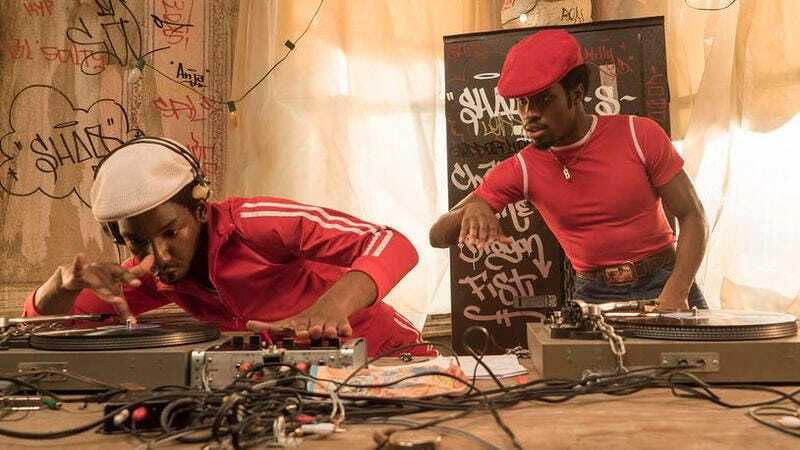 That’s what makes the Flash scenes work: they drive home The Get Down’s thesis of music being a sanctuary, a sort of Heaven on Earth—or, in the often dangerous world of the characters, a Heaven amidst Hell. The spiritual connection between music and freedom becomes even more blatant in the episode’s final scene, where Mylene spurns her father’s command to sing in the back of the choir. Knowing that her uncle, Papa Fuerte, has put a record executive who owes him money in the audience, she begins speaking in tongues, flailing about until she’s able to move to the front. She’s most likely faking the holy seizure, as she uses the opportunity to strip off her robes and launch into Machine’s “There But For The Grace Of God, Go I”—a perfect hybrid of disco and non-secularism. It’s pointless to fight any of this stylism when watching and reviewing The Get Down. Whether or not it’s Baz Luhrmann directing the episode, this is a show that’s not always going to embrace realism. But it’s becoming clearer and clearer that that choice works better with the joyous musical sequences than with the series’ grittier elements. Just contrast the turntable montages, church scene, and salon dance party with Cadillac’s interrogation of the two Savage Warlords. As “Superfly” plays on the Les Inferno speakers, he slides around the floor while grilling the young gang members about the shooting. At one point, he even sings into his revolver like a microphone. When he accidentally shoots one of the kids in the head, the camera cuts to black before holding on the bullet wound and a closeup of the dead child. It’s almost heartbreaking for just a second, but then Cadillac and his cohort start arguing about whose fault the death is like they’re in a Three Stooges short. And yet again, we’re left with a tonally confusing moment that relates to inner-city violence—something that shouldn’t be tonally confusing at all, given how it affects everyone on the show. I don’t want to fall into the repeated criticism of “Music stuff = good/Gangster stuff = bad” when reviewing The Get Down, especially when the ratio of the former to the latter seems to be improving. But at the same time, the contrast becomes more and more jarring when the musical elements keep getting better and the criminal elements keep getting worse. Unfortunately, by the end of the episode—when all of Shaolin’s equipment and records gets torched except for one turntable—it seems that he and Ezekiel are only going to get closer to Cadillac and Fat Annie. While so much great hip-hop is born out of a struggle, in a dramatic series, it’s best if the struggle stems from a legitimate threat. Cadillac and Annie are certainly threatening in that they could kill any of the main characters, but their characterizations continue to feel woefully out place with everything else. And that makes them not threatening at all, even though they very well should be. I’m going to start keeping track of every piece of music used in the show. For now, I’m calling this section “Keys to the quick-mix theory,” but am open to any better title suggestions. Most importantly, feel free to note anything I missed in the comments section, and I’ll add it to the writeup. Did the pigeon scene on the rooftop remind anyone else of Ghost Dog: Way Of The Samurai? I’ll say it once and I’ll say it again: Jaden Smith is usually so easy to make fun of. But he’s really good in this! Like really good. Like he’s able to sell the mysticism behind being a graffiti artist in a way that’s likable and not goofy. While I’m not a fan of his role on the show (so far), I always love seeing Lee Tergensen pop up in…well, anything. He’s great on Oz, he’s great on Generation Kill, and he may prove to be great in The Get Down. But let’s face it—this will always be his best work. We start off with another rap from the narrator’s Ezekiel/Nas/Daveed Diggs hybrid. We’ll see if the original songs ever get official titles. According to the track listing of The Get Down’s official soundtrack, the reoccurring “Shaolin’s Theme” was composed by producer Malay. When Ezekiel’s crew are passing around a joint and trying to solve the crayon mystery, that’s Henry Mancini’s “The Pink Panther Theme.” But you knew that. The first song being scratched by Shaolin is Lyn Collins’ highly sampled “Think (About It),” written and produced by James Brown. The second is “Assembly Line” by The Commodores. h/t to commenter MarkoP for pointing that out. As said above, that’s Vicki Sue Robinson’s “Turn The Beat Around” scoring the excellent dance sequence in the beauty shop.